Sani-Tech high-purity rigid piping systems are easier to install and maintain than stainless steel systems. Whilst other non-metallic piping systems can create internal entrapment areas. 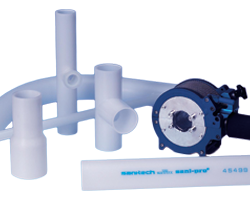 Sani-Tech rigid piping systems offer exceptional flow characteristics. Our piping and components are manufactured with inner diameter dimensions equivalent to stainless steel tubing. Because of this design feature, our products will mate to stainless steel connections with no changes in diameter or creation of entrapment areas. Sani-Tech rigid piping systems also feature sweep elbows, which allow improved flow over sharp elbows. Sani-Tech® systems also eliminate the need for routine shut-down and sanitation cycles. Most components are reusable and reconfigurable. Complete process control is gained through simplicity of design and consistency of contact surface, as well as uniformity of flow criteria within all flexible and rigid products. Manufactured with polypropylene and PVDF - performance-proven materials that meet and/or surpass FDA and USP standards and regulations. To further discuss the Sani-Tech Rigid Piping Solutions, and how we can help you.